When looking for a good “just in case” knife, there has to be a balance between the ideal knife, the practical knife, and the affordable knife. On the one hand, everyone has their eyes on a dream knife that they would want in the worst case scenario. It’s big, sharp, heavy, and expensive. 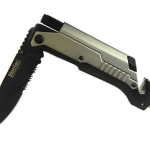 It’s also impossible to carry around, which makes it very hard to consider it a true “survival” knife. After all, a surprise catastrophe event won’t leave you with enough time to run home and dig out exactly the right knife for the situation. So it’s important to be realistic about knives and find one that will be useful in day-to-day life and easy to carry, as well as affordable, so that you know you will have it on you in case the worst does happen. That said, here’s the case for why the ESEE-6 knife is a perfect fit for that practical, useful, and reliable knife that you can use on a day-to-day basis and still feel secure with just in case of a disaster. First of all, the price. 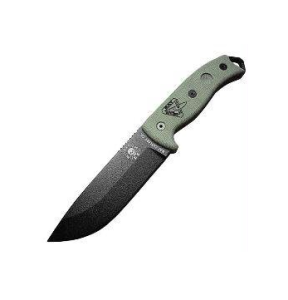 Depending on where you go, you can get the ESEE-6 for under $130. That’s not bad for a higher-end knife, and not so high as to make the purchase unreasonable. The knife’s specifications are as follows. 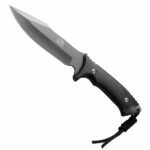 The cutting edge is 5.75 inches, with a total blade length of 6.50 inches and overall length of 11.75 inches. Different models of the ESEE knife have different blade lengths. 5.75 inches is a good length- not too long and not too short. 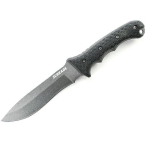 The blade itself is 1095 carbon steel, 1.56 inches wide with a drop point design. The knife weighs a light 12 ounces, making it easy to carry. It’s a very portable knife. The handle is made of micarta, and very comfortable to hold. The sheath is injection-molded plastic, and green. Out of the box, the knife is very sharp. The carbon steel blade is excellent for holding an edge. It holds up very well to rough usage, such as batoning and otherwise working with wood. The knife is also marketed to hunters who field-dress large game. While on the larger side for small detail work, the knife is light enough that it is not too much of a burden to also carry a small folding knife as a backup. The sharpness holds for a long time, one of the benefits of 1095 carbon. The blade does not need a great deal of care to stay sharp- a little bit of treatment with a rust protectant should be enough. In terms of portability, the knife’s size is an asset. The sheath comes with a clip to make it easy to carry. The ESEE-6 is light enough not to be a hassle when it is clipped or hung from a belt. It’s quite possible to make your own belt belt and use that instead. Some people are dissatisfied with the sheath that comes with the knife, but it’s not difficult to order a separate sheath or make one if it is really that much of an issue. The handle is comfortable, but needs to be cleaned occasionally. 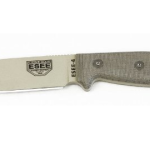 For value for money, it’s hard to beat the ESEE-6. There might be “better” knives out, but in its price class, the 6 is dominant. It isn’t easy to justify spending more than $150 on a single knife, so it’s good to know that there are great choices within that price range. Most importantly, the ESEE-6 is useful enough that you will always want to bring it along outdoors. The hardiness of the edge and comfort of the handle means that you will reach for this knife before others for anything but the smallest knife work. Of course, that also makes it better as a disaster survival knife. You’d want the knife that you always carry to be the one best suited to survival, and the ESEE-6 is worth carrying around. Other ESEE knifes tend to be a bit small, so they might be more suitable for a person with small hands. Be sure to shop around and try to get a good price, as occasional sales can make the knife bcome cheaper.